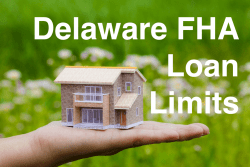 What are FHA Loan Limits in Delaware? FHA loans are a low down payment mortgage program and Delaware FHA loan limits are connected to local home values. Search the charts below to determine the maximum mortgage amount allowed for your county. FHA loan limits in Delaware are set above the floor amount of $275,665 across most of the state. Delaware FHA loan limits can change at any time. Check back often to ensure accurate information. How are Delaware FHA Limits Set? Mortgage limits for Delaware FHA loans are based on median housing prices for the particular county and Metropolitan Statistical Area (MSA). More specifically, “Median Sale Price” for area homes in each county or MSA is considered the determining factor. National FHA mortgage limits for low cost areas are set at 65 percent of the national conventional conforming loan limit. FHA loan limits are updated yearly. Purchase Loans – The mortgage loan-to-value limit in DE is 96.5% of the lower of the purchase price or the appraised value of the home. Refinance Loans – The refinance loan-to-value limit in DE is 97.75% of the lower of the appraised property value, or the mortgage amount plus closing costs. If you’re refinancing and taking cash out from equity, the loan limit will be limited to 85% of the appraised home value.